In October of 2018, we traveled to Nepal to complete the Tillman Pass and Ganjala Pass trek. We approached the Tillman Pass from the south side via the Panch Pokari Ridge. 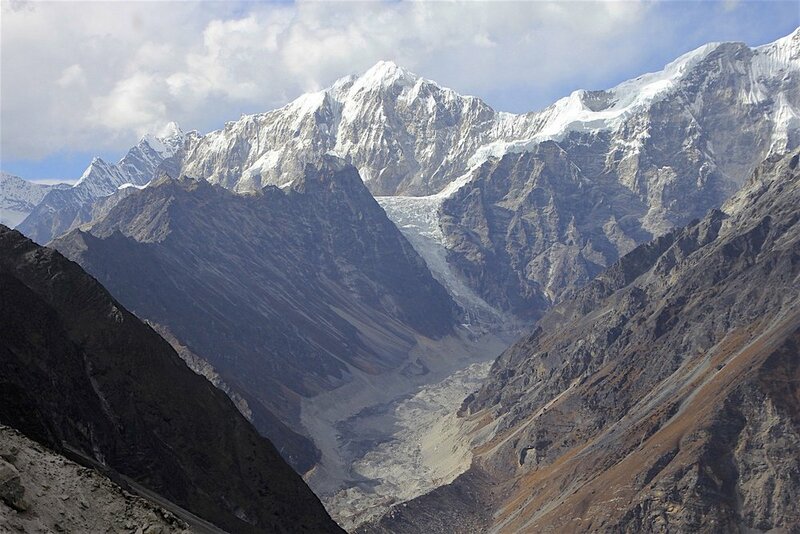 We then descended to the Langtang Valley, explored the Langtang Glacier and exited the Valley via the Ganjala Pass. We also managed to take a helicopter tour of the Langtang Valley north of Kyanjing Gomba. 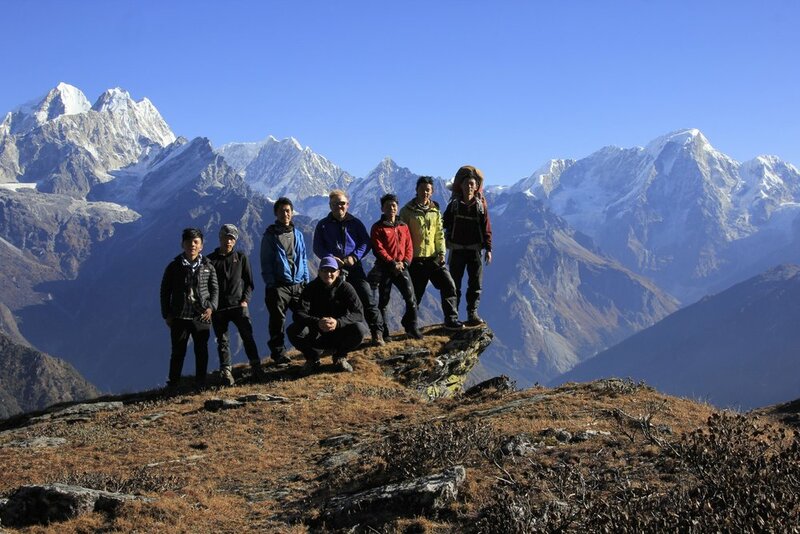 All in all, it was a wild and challenging trek through a wild and remote area of the Langtang Himal. Thanks again to mountainsunvalley.com for all the support and help with putting this together. See the wonderful page HERE with detailed annotations of various mountains in the Langtang and Jugal Ranges from this trek. Also, see the page HERE with detailed annotated photos from our helicopter flight in the Langtang Range. For photos from the Yala trekking peak see the page HERE. It is one of the best spots for the panoramic views of the Langtang Range because of its central location. The Langtang Range from the air. Langtang Lirung is on the left/centre and Shishapangma is on the left. The Langtang Range with Mt. Shishapangma dominating the skyline. Tilman Pass is on the top right and the Langshisa Glacier is in the middle - our route down from the Tilman Pass. Tilman Pass and the high camp (by the frozen green lake). Closeup of the Tilman Pass from the helicopter. Second day of the approach to the Tilman Pass. We were in thick clouds during the day on this section of the trek. 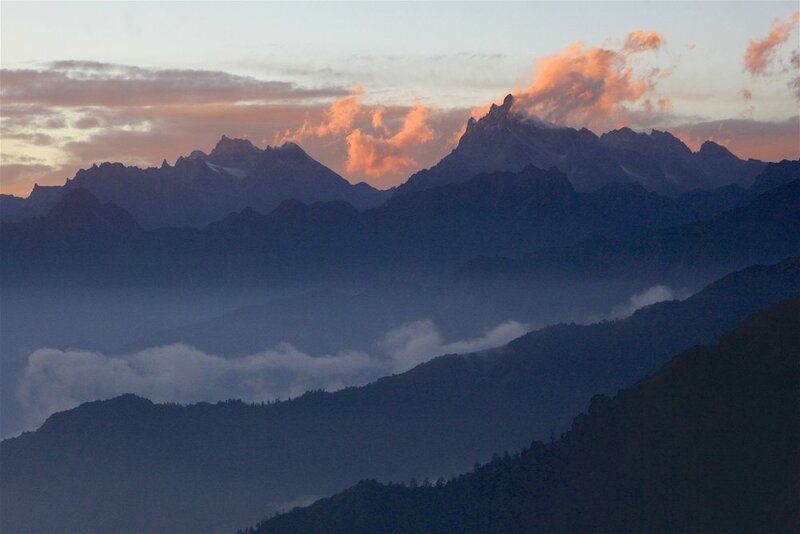 Beautiful sunrise over foothills of the Himalaya. This region is called Helambu. Gur Karpo Ri, Dorje Lakpa and Jugal Himal from the south. These mountains are located in China. Shishapangma peaking from behind the ridges of the Langtang Himal as seen from the south, still a long way away from where we were! Langtang Lirung and Ganjala Pass (on the left) from the south. Blue hills of Nepal in early morning mist. A funky trail over some steep terrain. Our final camp before Panch Pokhari. 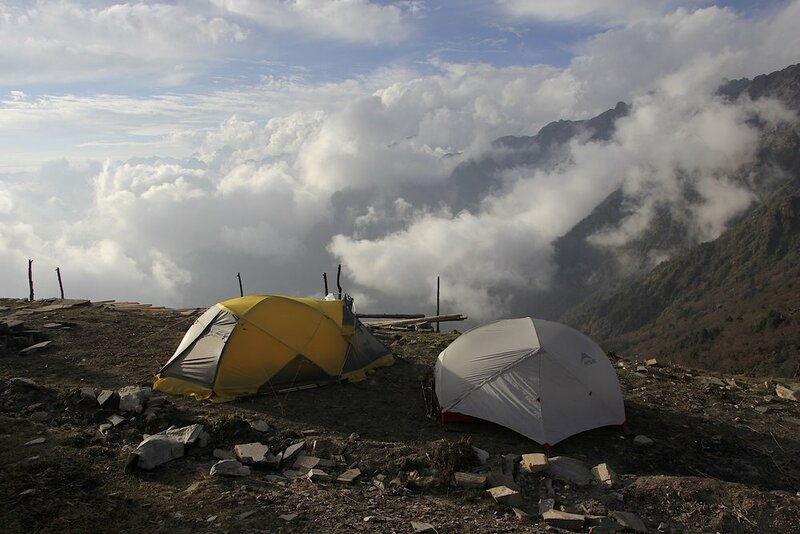 This was one of the most scenic campsites on this trek. Our Chef in action! It is quite unbelievable what can be made in these conditions. One of many spectacular campsites. High on the ridge near Panch Pokari during a spectacular sunsent. A mani wall and Buddhist prayer flags. Mani walls are walls built by followers of Buddhism. The walls consist of hand-crafted tablets inscribed with Buddhist prayers and images of the Lord Buddha. Dorje Lakpa in full sunset glory. Langtang and Jugal Himals the sunset. The view of the Langtang Himal (the high peak is Dorje Lakpa) from far away. We approached the pass on a long ridge with very little water available along the way. The lack of water was a big problem in finding suitable spots for camping. The Langtang and Jugal Himals from the south. The ridge we followed offered spectacular views in the morning and evening. During the day, massive clouds obscured all views. On the left is Gurkarpo Ri 6,889m, to its right is Dorje Lakpa 6,966m and then the unnamed sister peak 6,563m. Jugal Himal from the south (the mountains int his photo are located in Tibet). Our entire crew in front of the magnificent panorama of the Jugal Himal from Panch Pokari at 4,250m. Our campsite at Tin Pokhari. We had one but very intense snow storm. Thankfully, it did not extend beyond Tin Pokari. Cold night! -10C inside the tent. The approach glacier to Tilman Pass from Tin Pokari. The pass is hidden behind the mountain in the forefront. The approach glacier to Tilman East Pass from Tin Pokari. It looked like a spectacular route. We walked to the end of the moraine int he photo by accident. It was an exploratory trip half way up to the East Tilman Pass. Looking back at Tin Pokhari en route to the Tillman Pass East. We ascended the wrong glacier and did not realize our mistake until we were 10km in and at 4,600m! It did however give us an opportunity to explore the approach to the Tilman Pass East. This basically took up the entire day. The glacier leading to Tilman Pass East. We went all the way to the end of the moraine before we realized our mistake! The flat top mountain is Gur Karpo Ri 6,892m. The large mountain on the right is Dorje Lakpa 6,966m. Gur Karpo Ri 6,892m and the Tilman Pass East - close up of the pass. It looks very doable! The final stretch to the Tilman Pass East from the high point of our sortie. Dorje Lakpa Glacier with Mt. Dorje Lakpa on the left. The glacier leading to the Tilman Pass - now we are on the right path! Ascending the long moraine before gaining the glacier to approach the Tilman Pass. Looking back towards the Jugal Himal in China. We came from behind the ridges in the centre of the photo. We needed to get to the end of this glacier. The pass is the little white speck at the very end of the glacier on the left side of the photo. Half way up the glacier. The Tilman Pass, now clearly visible, is still a few hours away. Descending from the moraine to the glacier was steep and tricky. We were concerned about possible rockfall. Shyam, our guide and fearless leader - facing the unknown with a smile! Approaching the Tilman Pass high camp. 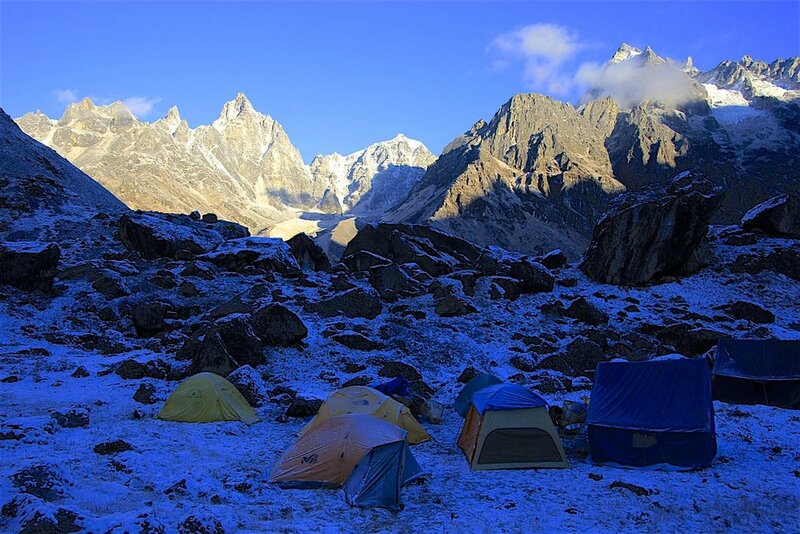 The camp is located between the pass and the the white lip of the glacier. Tilman Pass high camp - looking south. The Tilman Pass - south high camp with the pass ahead. The high camp for the Tilman Pass. Scouting the route trough the Tilman Pass. We were lucky with the right weather conditions. For the sense of scale, spot the people on the right above the rock shelf. Ascending the Tilman Pass at 7am. The Tilman Pass ice fall. The Tilman Pass ice fall. We had to ascend the rocks to the right to bypass the icefall. The upper secion of the icefall. Almost there, reaching the crest of the Tillman Pass. The glacier we came from is visible below. Tilman Pass 5,300m. Mount Ganchempo looms above. Looking back south from the top of the Tilman Pass. Tilman Pass, view to the north. The mountain in the centre of the photo is Langshisa Ri. The Langtang Himal from the pass. 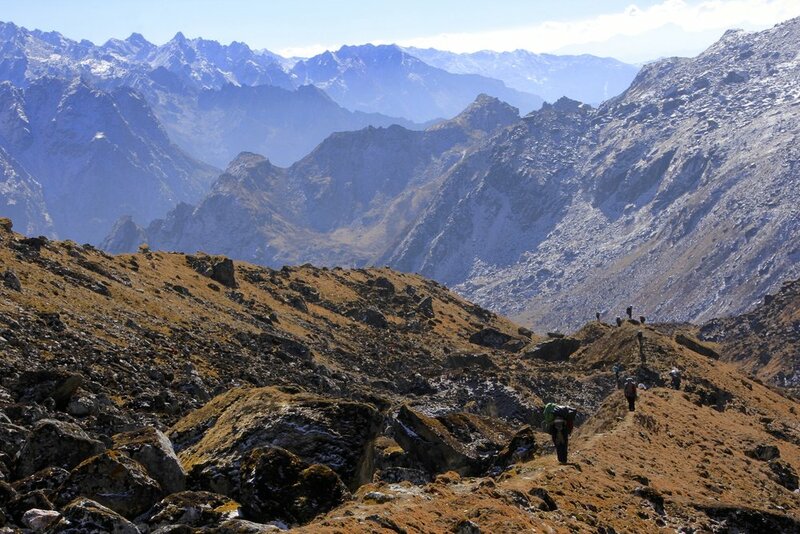 The Tilman Pass is not the best for the views of the Langtang range. 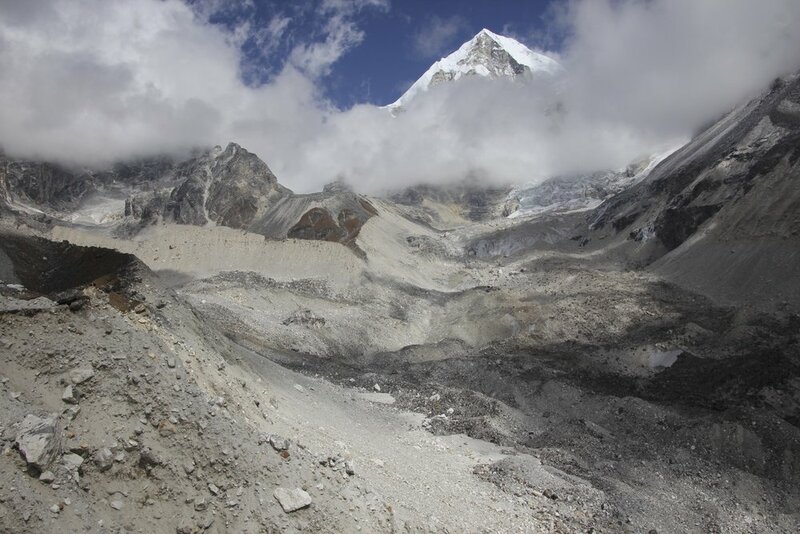 However, the area around the high camp and Langshisa Glacier is fabulous! The crevices were visible so it was easy to navigate around them. Descending the glacier using the fixed rope. 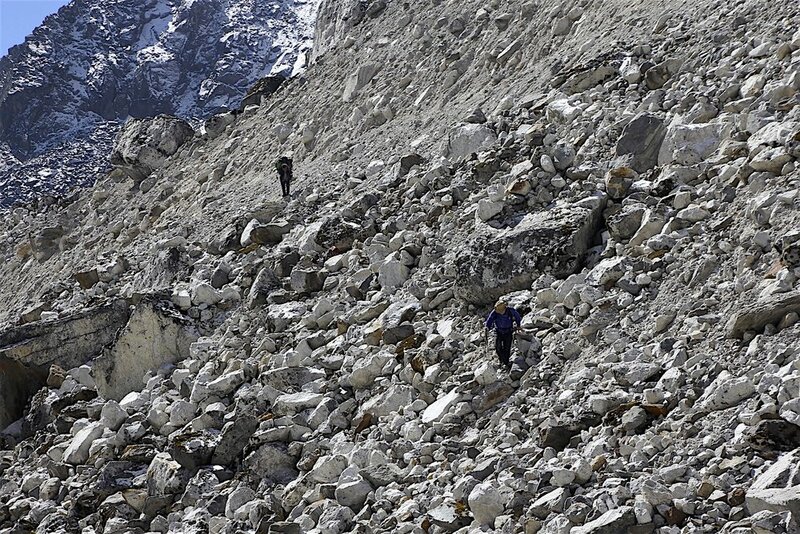 The steeper section had a fixed rope for the porters as they had no crampons. The fixed rope made for an easy and quick descent for everyone. Descending from Tilman Pass glacier to the high camp. This section was steep, icy and unstable. 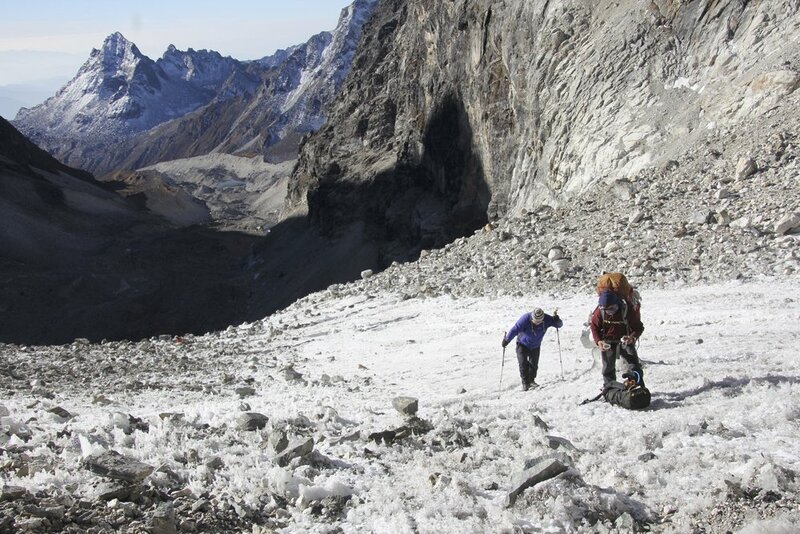 Negotiating the endless moraines was the biggest challenge for the porters. The high camp was by the frozen lake. Mount Langshisa Ri and Langshisa Glacier are behind the lake. Looking towards Langshisa Kharka and the Langtang Valley from the high camp of the Tilman Pass. This was a very beautiful area to explore. 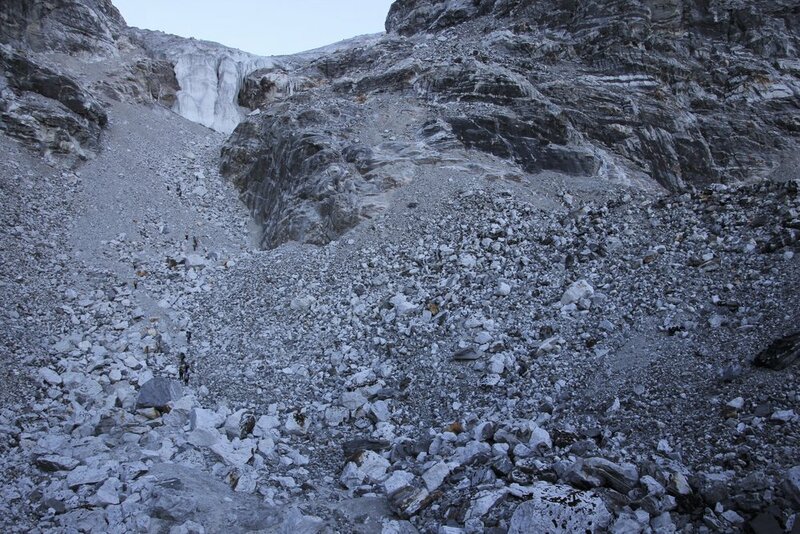 Langshisa Glacier - our descent route down to Langtang Valley. 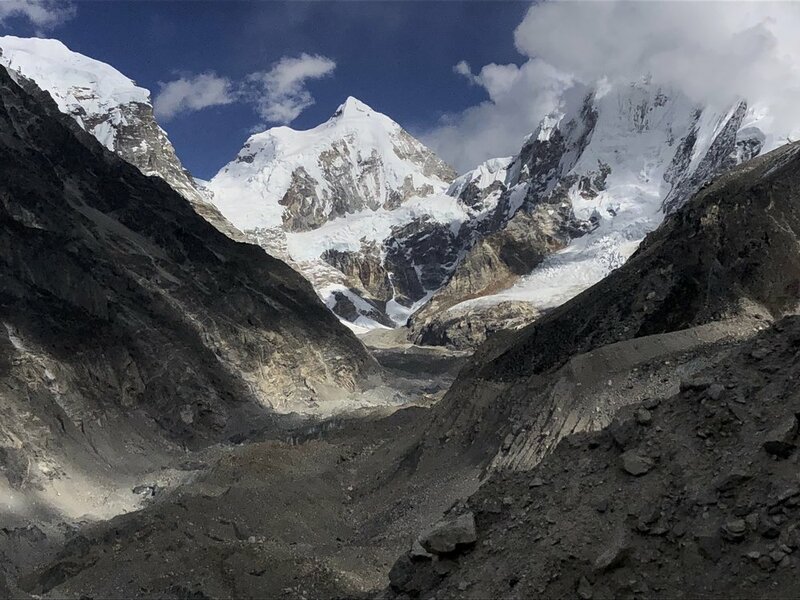 The Yala Peak is on the rock ridge on the left - it is hard to believe that it is 5,500m high! 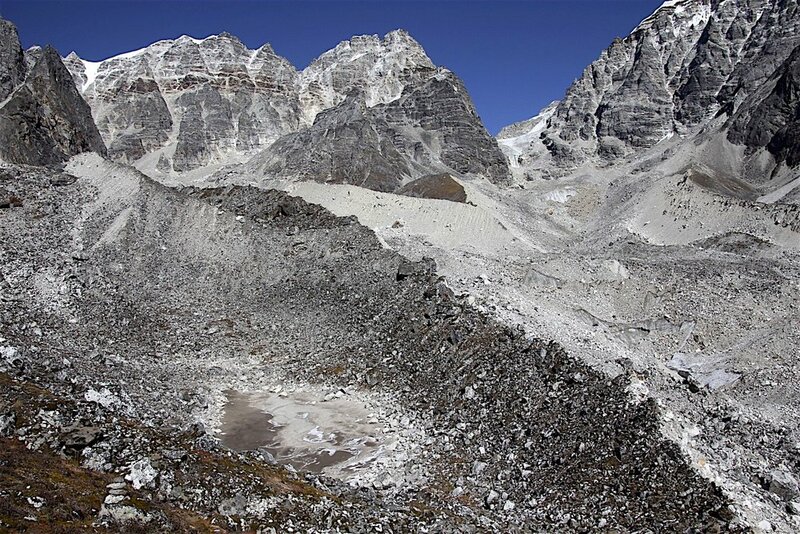 The view from the moraine of the Langshisa Glacier to the high camp of the Tilman Pass. Around the north high camp of the Tilman Pass. 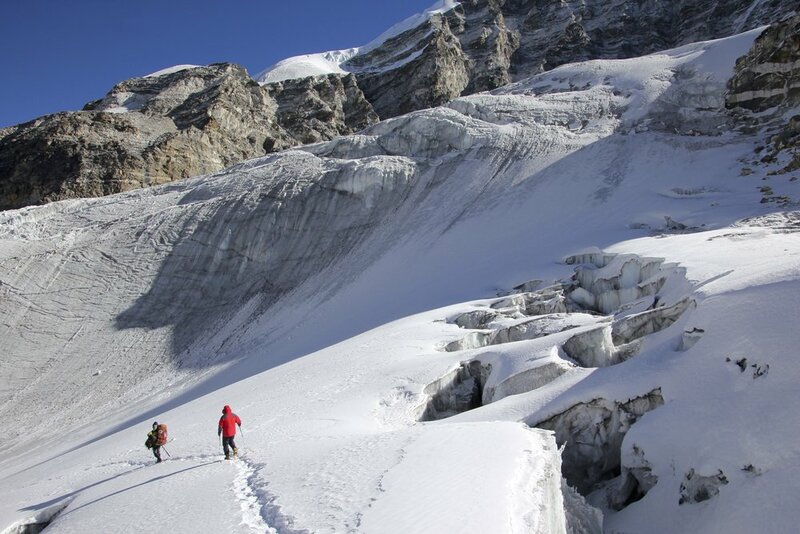 Langshisa Glacier. On the left is Gur Karpo Ri 6,892m, in the middle is Loempo Gang 6,979m and on the right is Dorje Lakpa 6,966m. 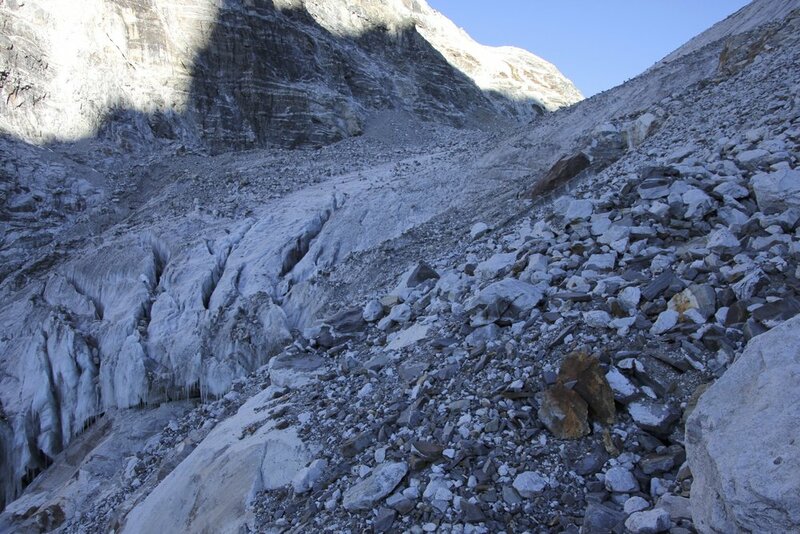 Descending to the Langshisa Glacier on loose, unstable and steep moraine. Steep and loose; this area is prone to rock fall and turns many people around if they are trying to approach the pass from the north. The rocks were falling with high frequency. Crazy moraines! After the sun hits this slope, the bombardment starts. The rocks are held by consolidated frozen mud. Mount Dorje Lakpa 6,966m dominates the end of the valley. We descended the crazy moraine on the right! It was like walking through a giant rock quarry. 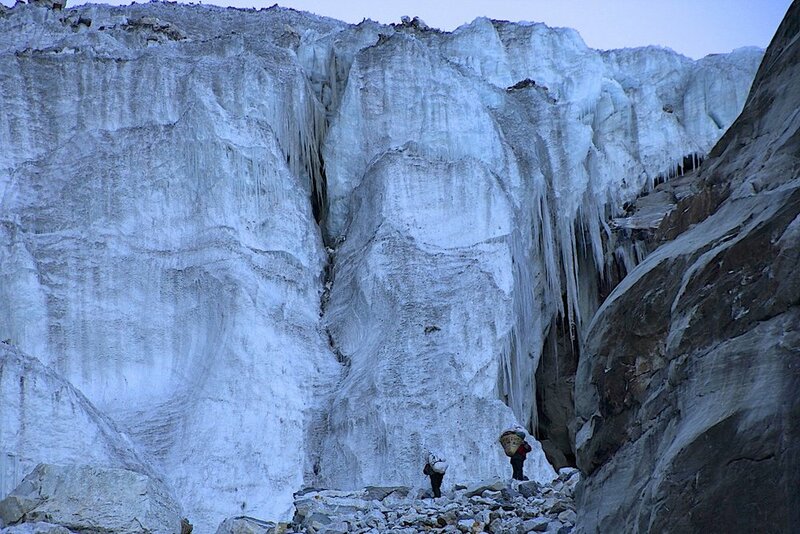 The snout of the Langshisa Glacier with an impressive ice cave. Neither David nor Shyam were keen to explore the inside of it! 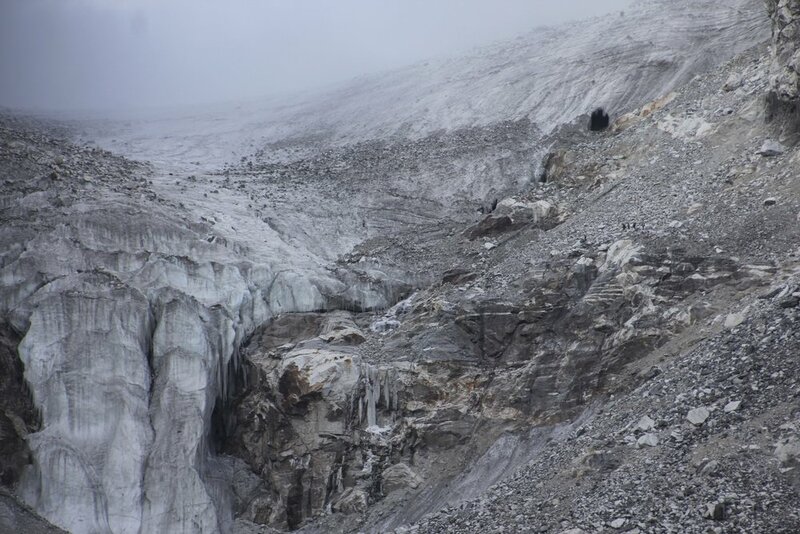 Lower part of the Langshisa Glacier. Almost off the rubble! The snout is now in the distance. We were ready to ford the Langtang River but to our surprise there was this beautiful bridge. The snout of the Langtang Glacier is in the distance.